Margot, Daphné, Théo, Lucas, and Romane. Ten people whose lives were to be turned upside down at the Bataclan concert hall in Paris on 13 November 2015. The characters in this story are all fictional ones – they have been imagined, invented, yet they might be familiar to you for they are all of us. This is a novel indeed, but it is first and foremost a tribute to all those that were assassinated that night. 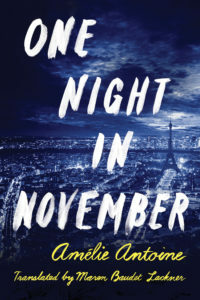 One Night in November is not an eyewitness account – but it aims to bear witness to the most intolerable reality. They were the perfect couple—but not all is as it seems. Young married couple Gabriel and Chloé have a picture-perfect life. But when athletic Chloé suddenly drowns, Gabriel is left to grapple with the mysterious circumstances of her death. Broken-hearted, he pours out his grief in a bereavement group and is consoled by photographer Emma. While the two grow closer, Gabriel can’t help but feel Chloé’s presence everywhere he goes. And as revelations about Chloé slowly emerge, he begins to wonder, is Emma really that different? 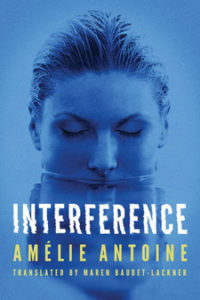 From prize-winning and bestselling author Amélie Antoine comes a dark and evocative novel that will keep readers guessing until the final moments—will Gabriel be able to move on with Emma, or will the mystery of Chloé’s death consume him? This novel (ebook and paperback) is available on Amazon.com, Amazon UK, Amazon Canada and Amazon Australia.